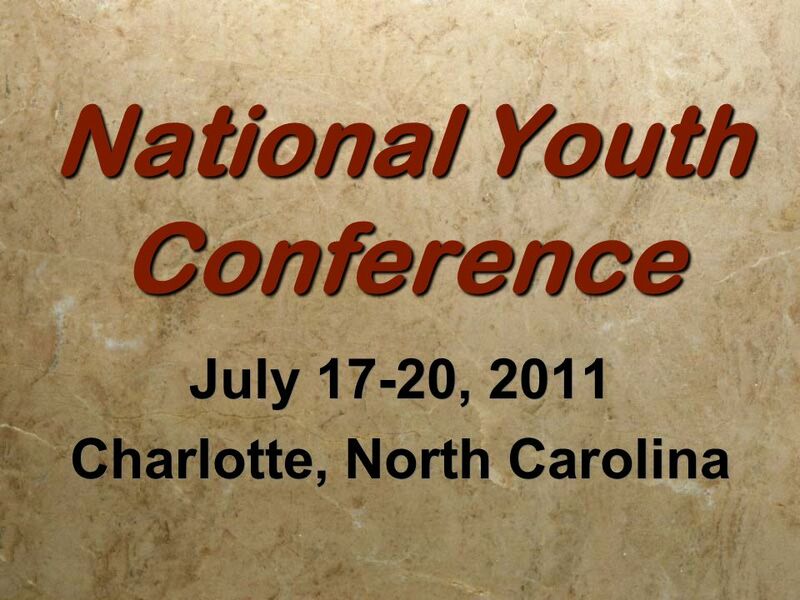 National Youth Conference July 17-20, 2011 Charlotte, North Carolina July 17-20, 2011 Charlotte, North Carolina. 16 Reach That Guy Youth and youth workers participate in community service projects designed to make an impact in the host city. 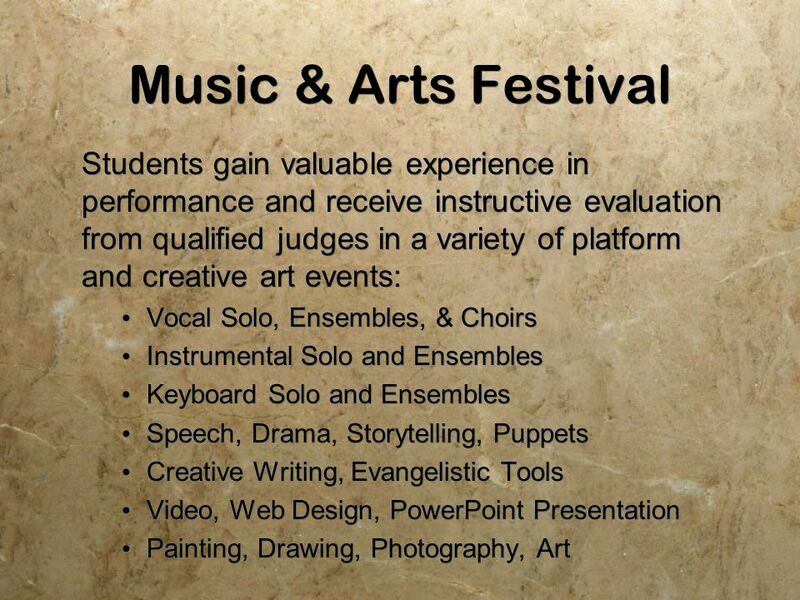 Projects include a blood drive and 3,000 hours of community service projects with local non-profit agencies. Make a difference in someones eternity. Participate in Reach That Guy projects. 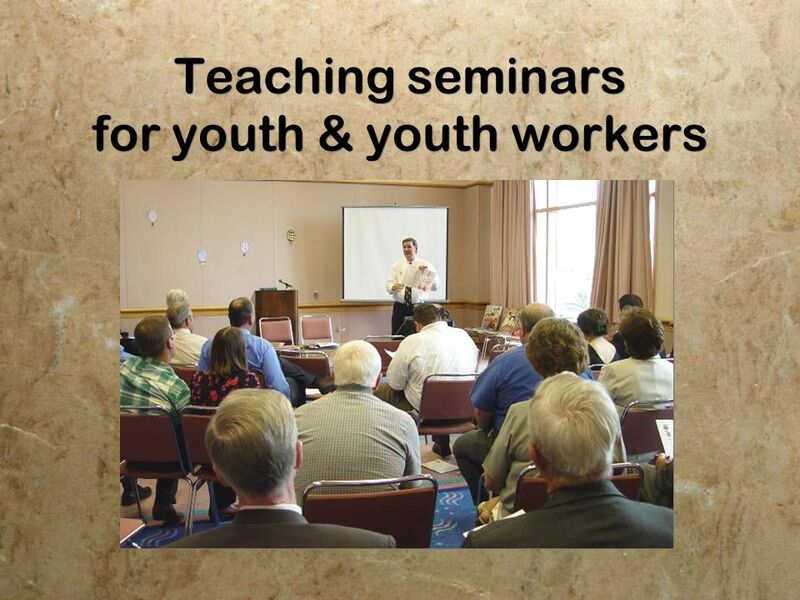 Youth and youth workers participate in community service projects designed to make an impact in the host city. 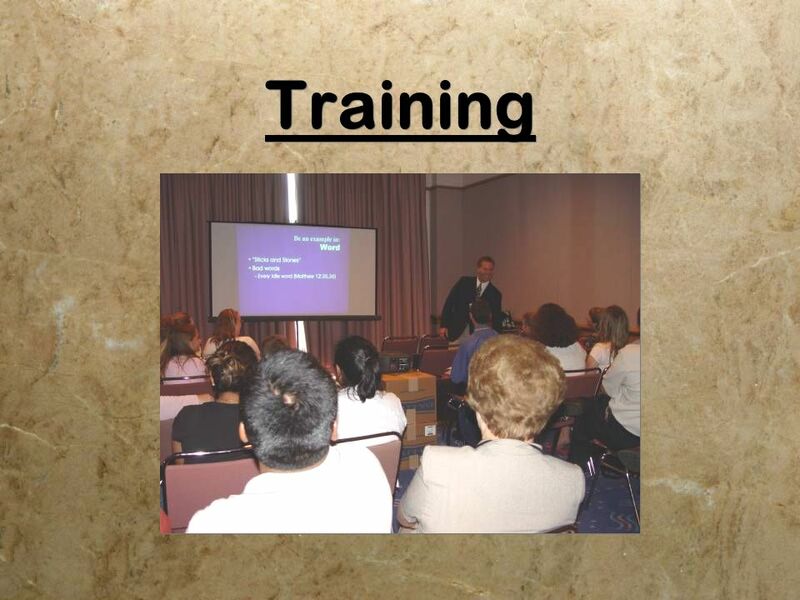 Projects include a blood drive and 3,000 hours of community service projects with local non-profit agencies. Make a difference in someones eternity. 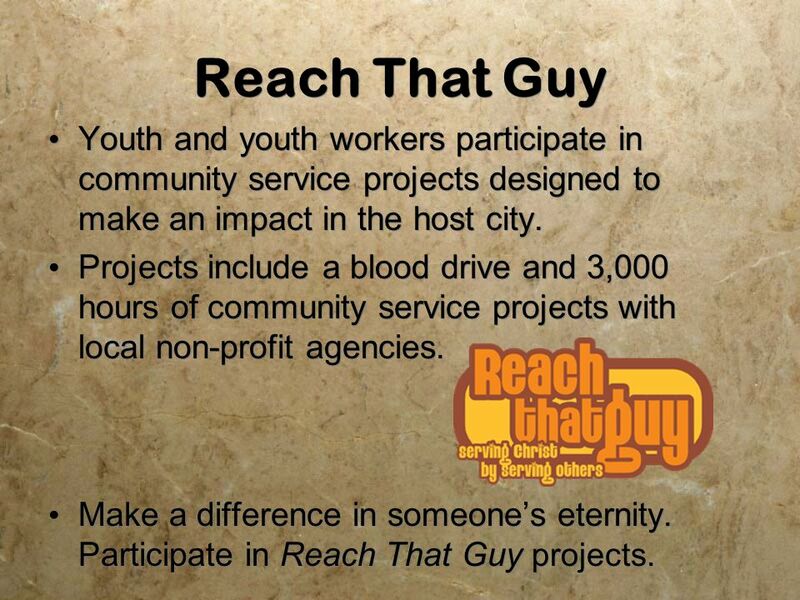 Participate in Reach That Guy projects. 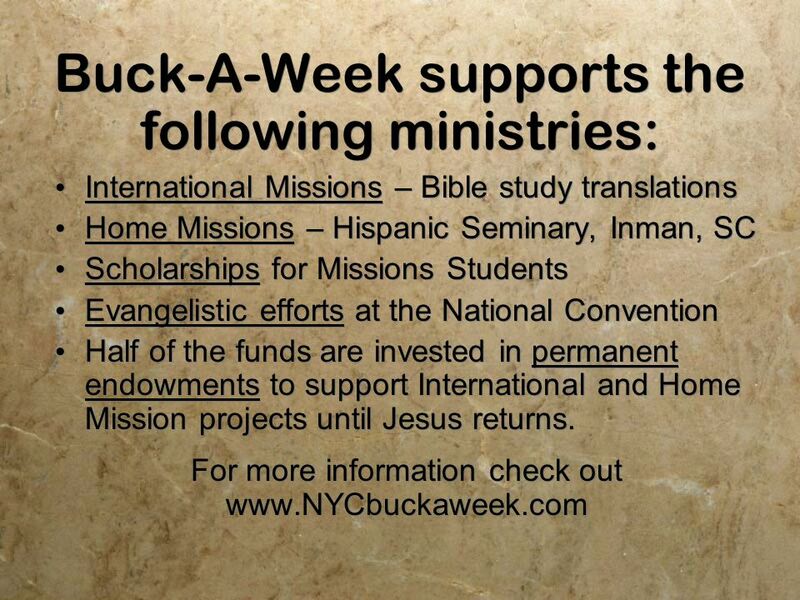 17 Buck-A-Week Students can make a significant impact in global missions. 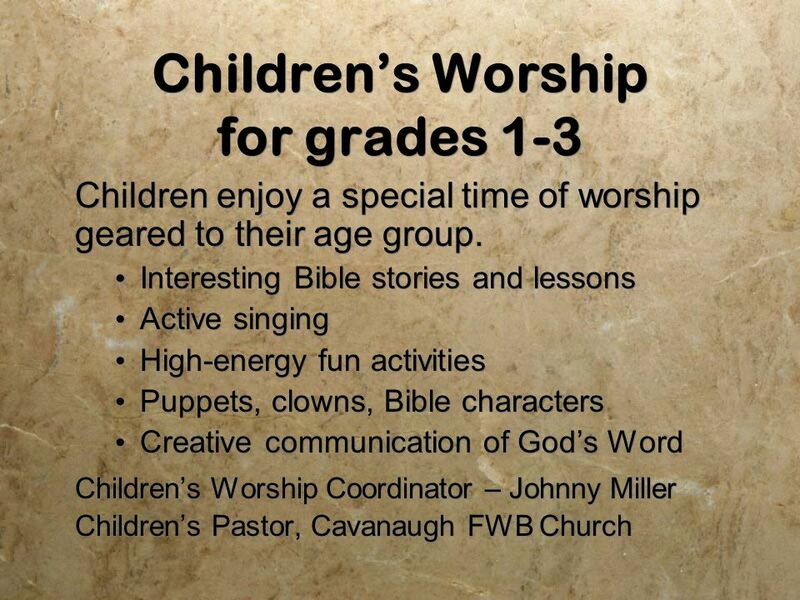 Share in spreading the Gospel at home and around the world. Support Buck-A-Week with with just one dollar each week. 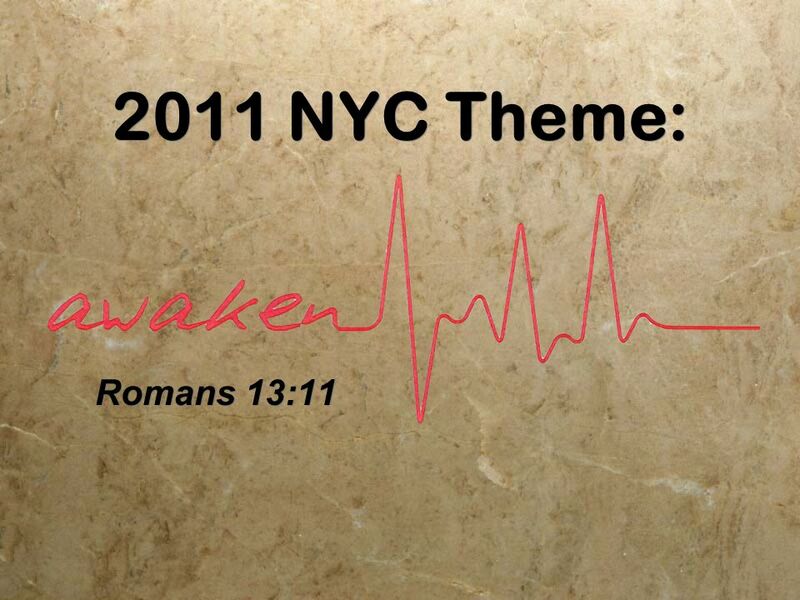 Buck-A-Week offerings will be collected during the Tuesday night NYC worship service. 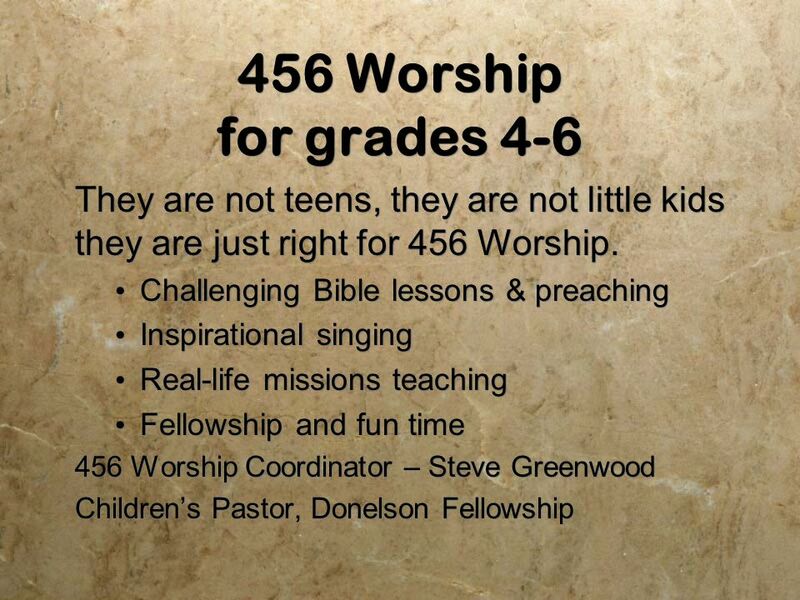 Students can make a significant impact in global missions. 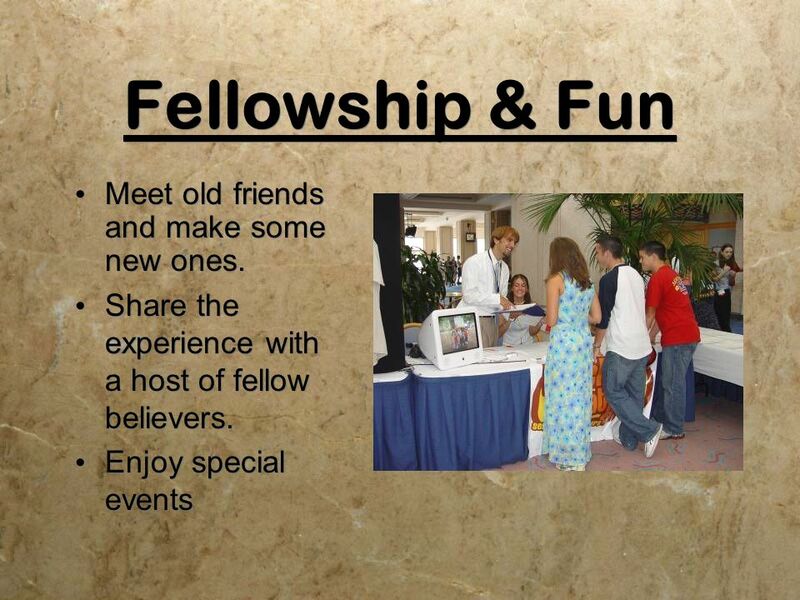 Share in spreading the Gospel at home and around the world. Support Buck-A-Week with with just one dollar each week. 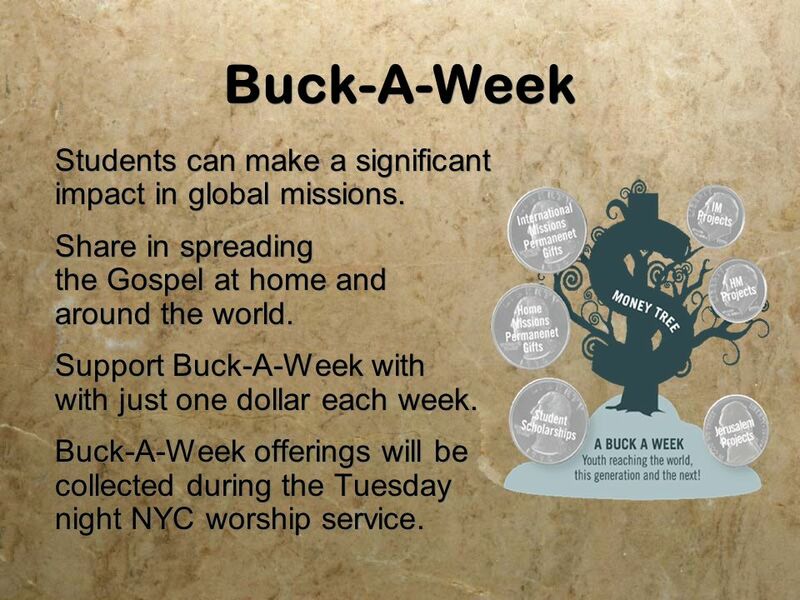 Buck-A-Week offerings will be collected during the Tuesday night NYC worship service. 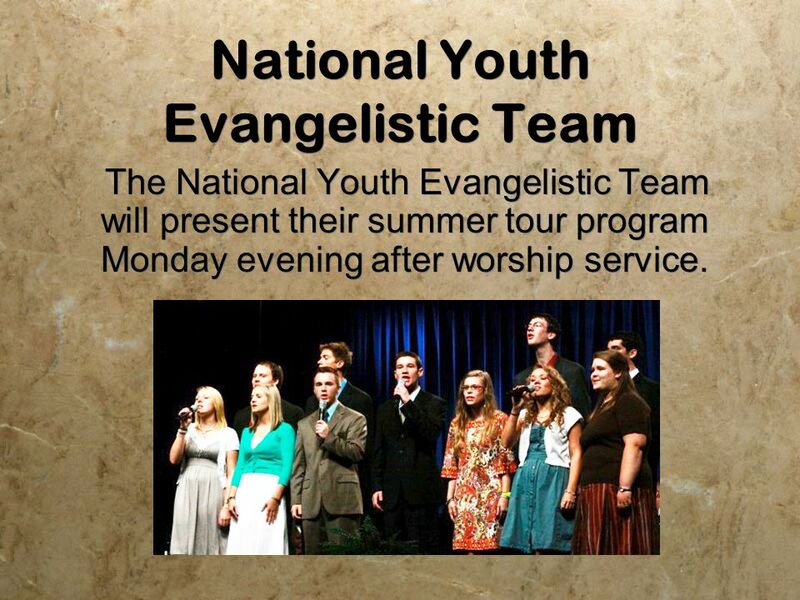 19 National Youth Evangelistic Team The National Youth Evangelistic Team will present their summer tour program Monday evening after worship service. 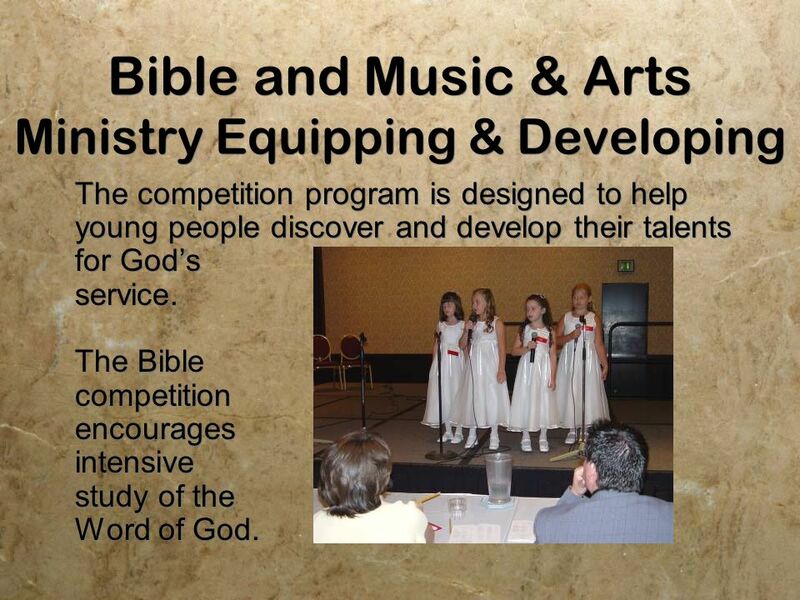 25 Bible and Music & Arts Ministry Equipping & Developing The competition program is designed to help young people discover and develop their talents for Gods service. 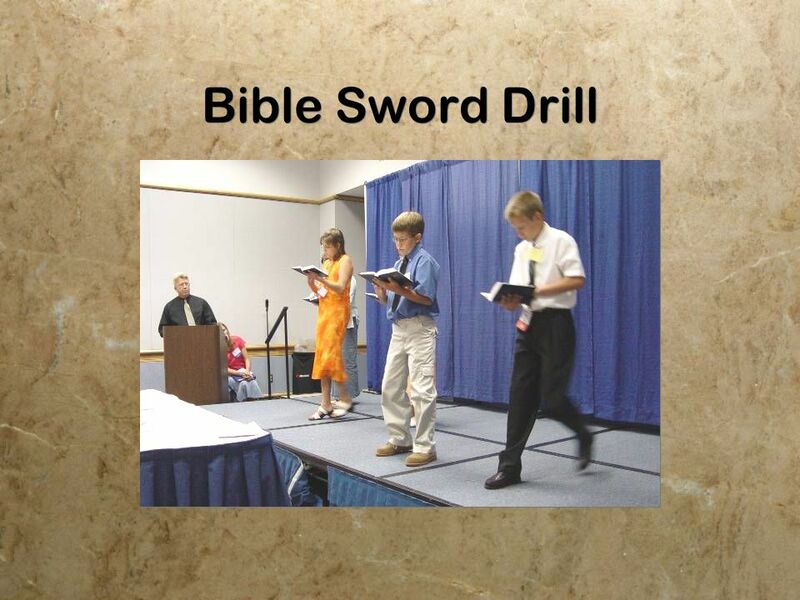 The Bible competition encourages intensive study of the Word of God. 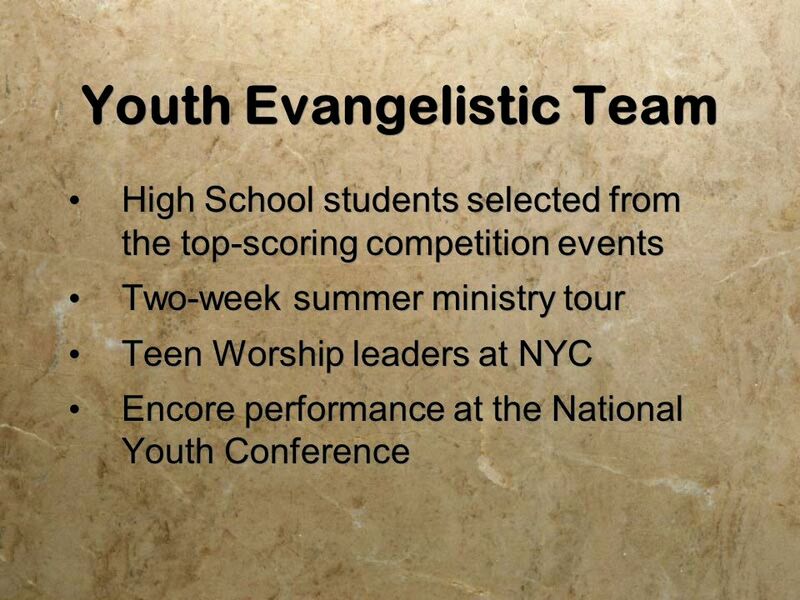 The competition program is designed to help young people discover and develop their talents for Gods service. 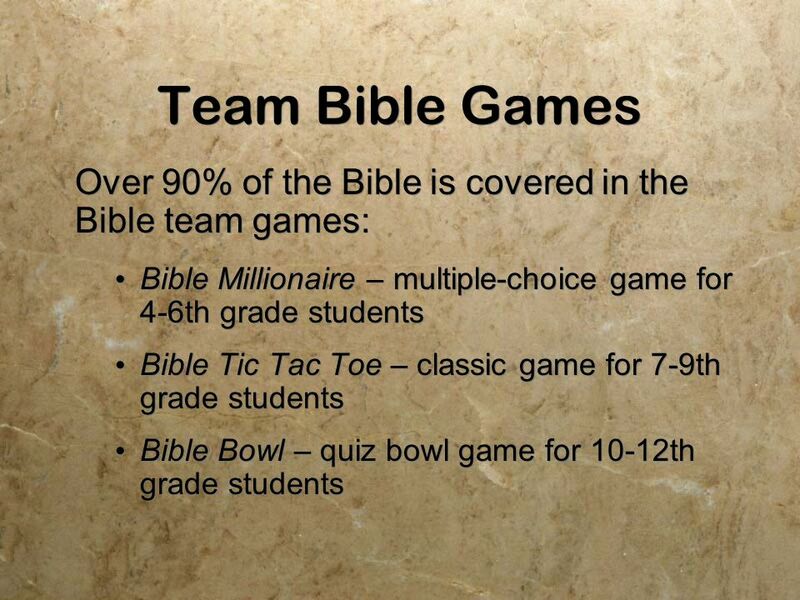 The Bible competition encourages intensive study of the Word of God. 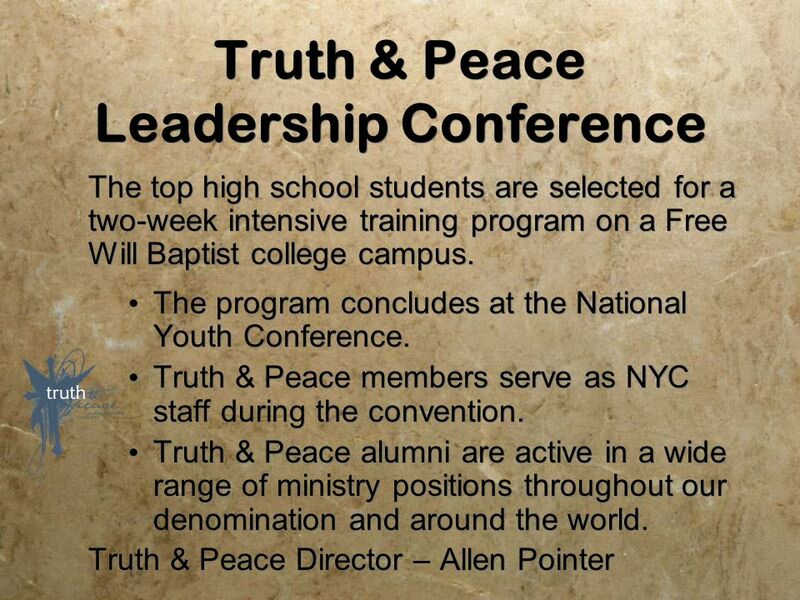 Download ppt "National Youth Conference July 17-20, 2011 Charlotte, North Carolina July 17-20, 2011 Charlotte, North Carolina." 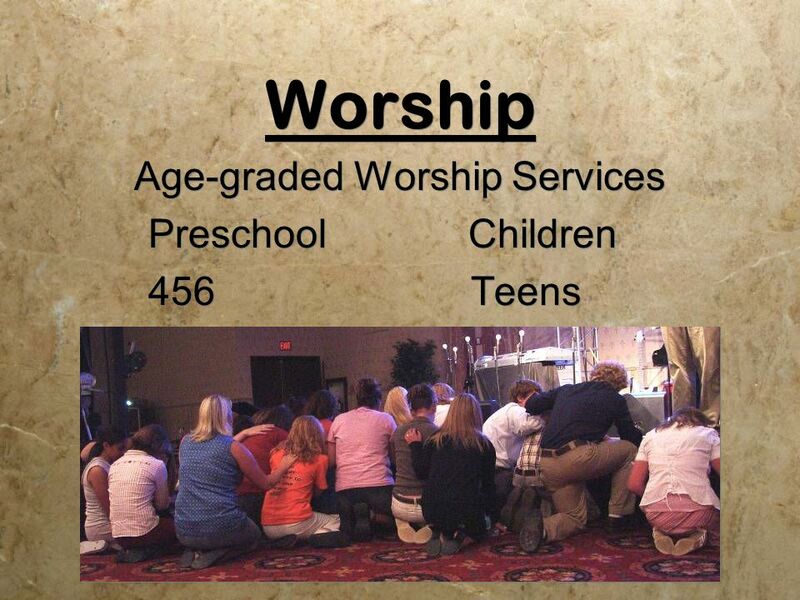 Welcome to the Worship Arts Ministry!!! 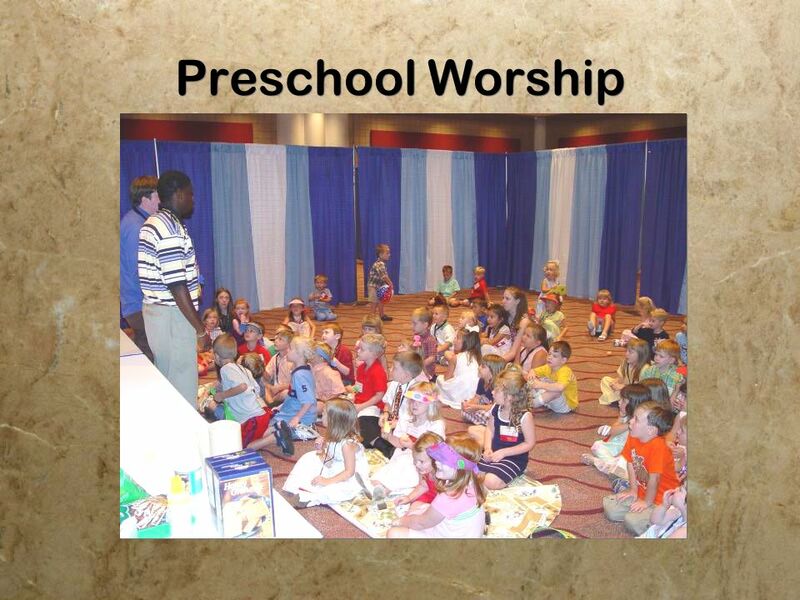 Darryl K. Mason Sr. Minister of Worship Arts Woodlawn Chapel Gospel Service. 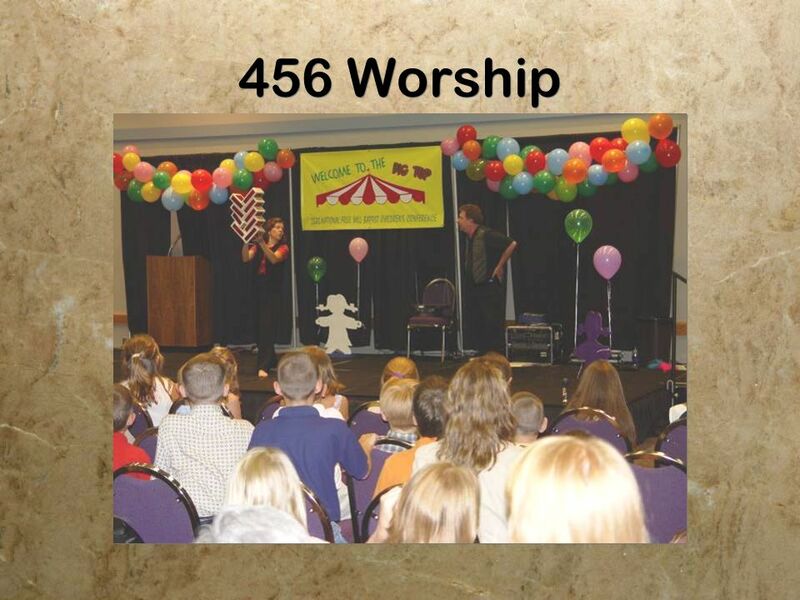  All religious award programs are faith-based CHURCH awards used by the Boy Scouts of America (and other youth organizations)  “Duty to God” is recognized. 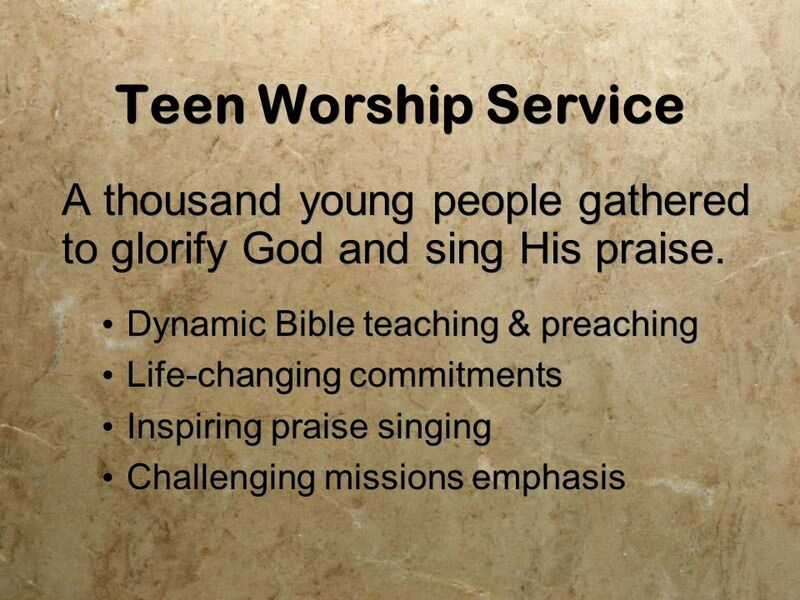 ARE YOU READY TO LAUNCH YOUR FIRST PUBLIC WORSHIP SERVICE?????? Twenty-one questions for your leadership team, core group, and parent church to ask before. Version 0.6 int. New Life BP 2013 Church Camp Committee. 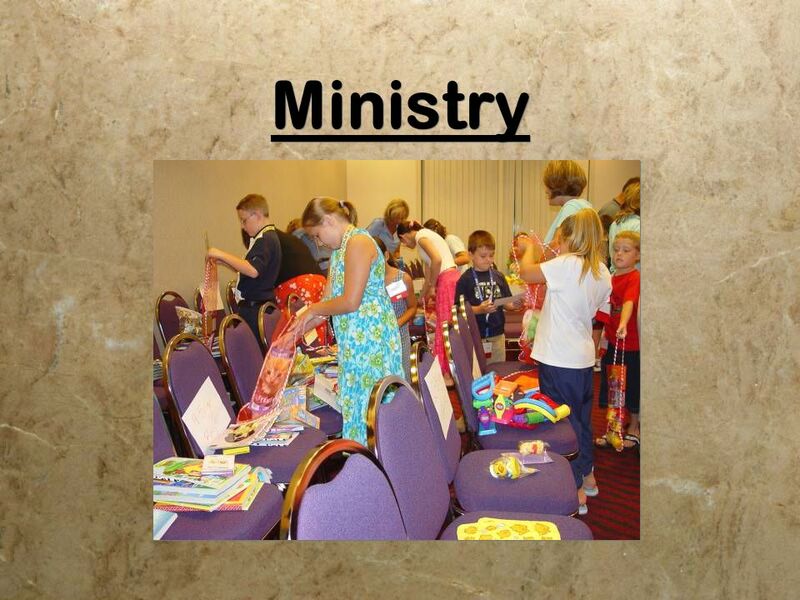 Workshop Rotation Model FunDay School Reinventing Sunday School. 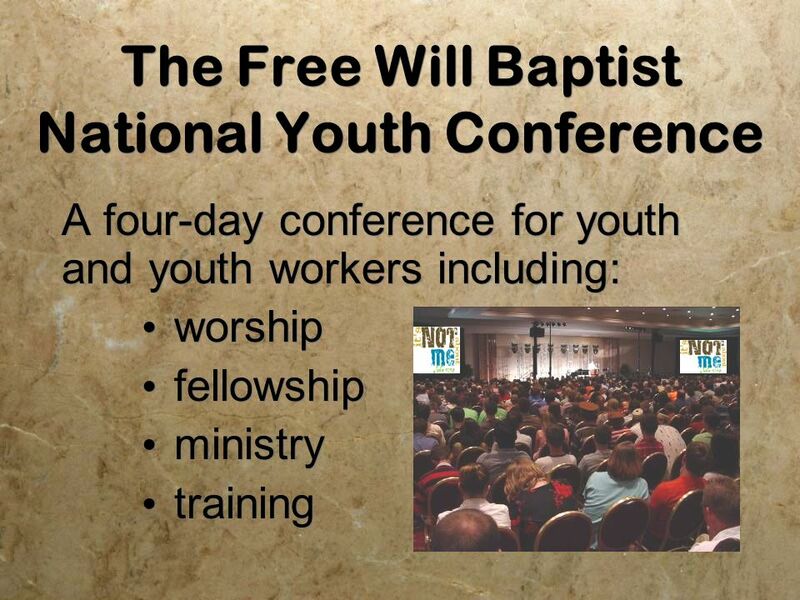 Youth Quizzing Ministry. 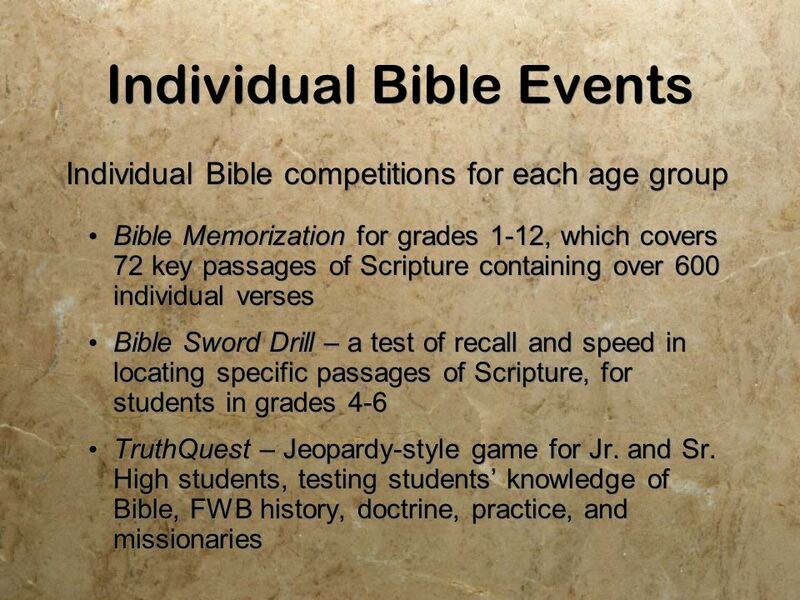 What is Bible Quizzing? 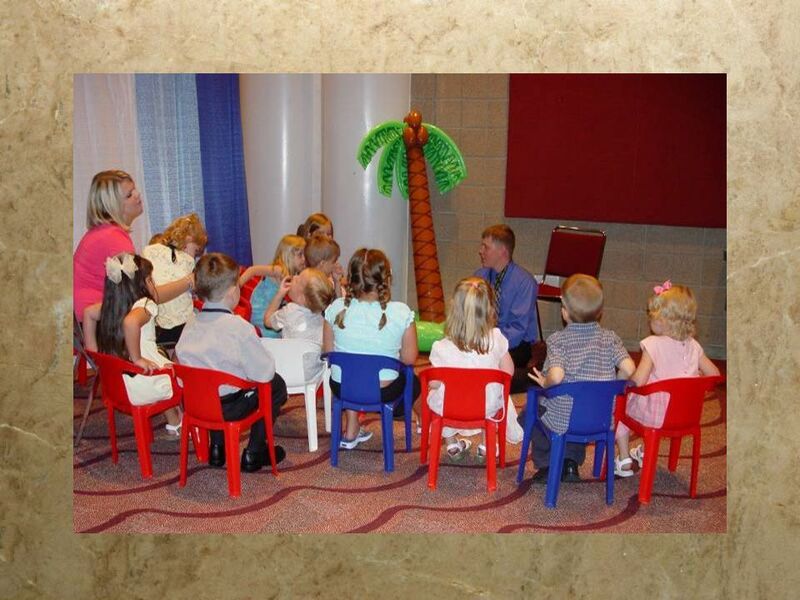 Helps youth study and learn about the Scriptures through a weekly small group Bible Study. 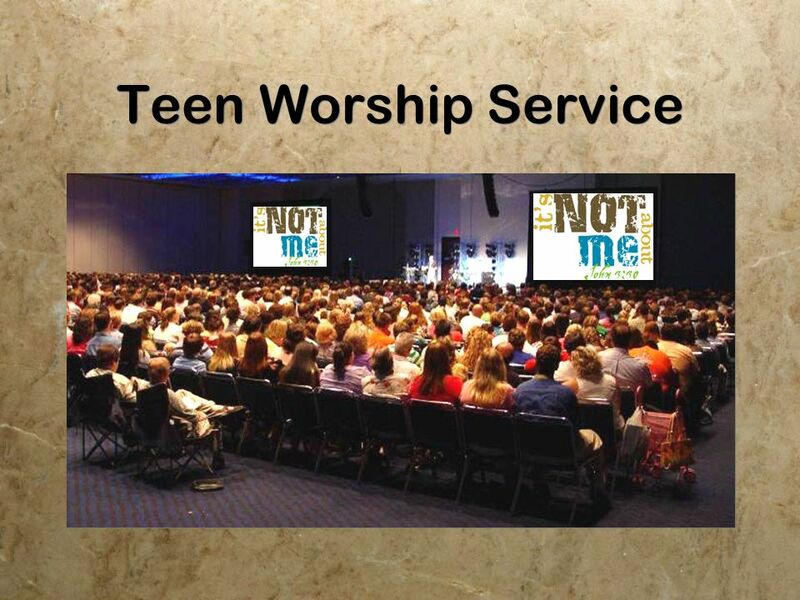 Mission 2015 Presentation General Aims For people of all ages to be impacted by the gospel and for some to make a personal commitment to Christ To see. 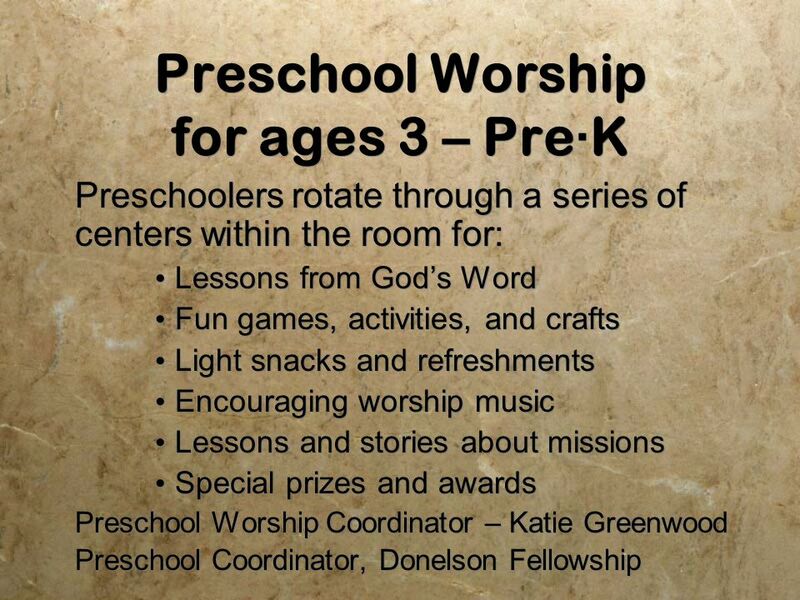 First Baptist Church Pastor D.L. 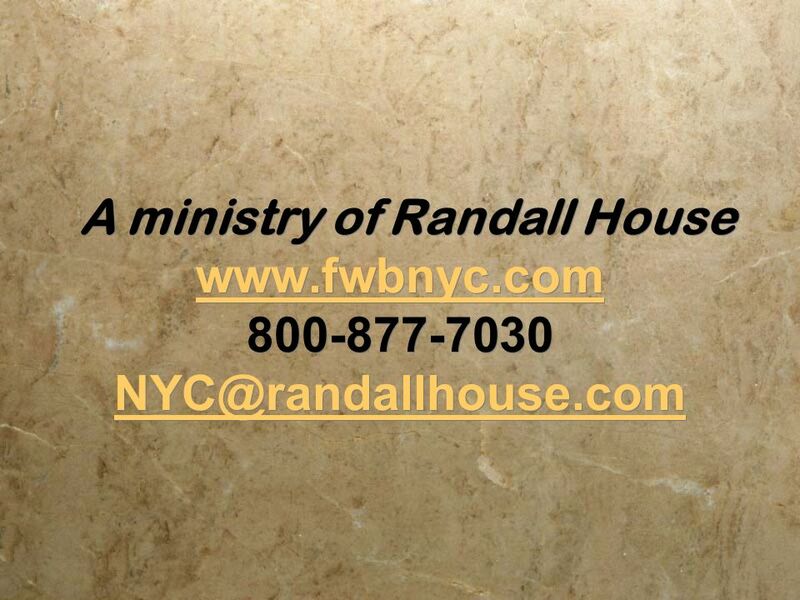 Richardson, Ph.D. Conquering Communities for Christ Faith Vision 2012 Next Level Transformation. ANNOUNCEMENTS JUNE 5, WELCOME EVERYONE!! Dear Guest, We want to say that. ANNOUNCEMENTS MAY 15, WELCOME EVERYONE!! Dear Guest, We want to say that. 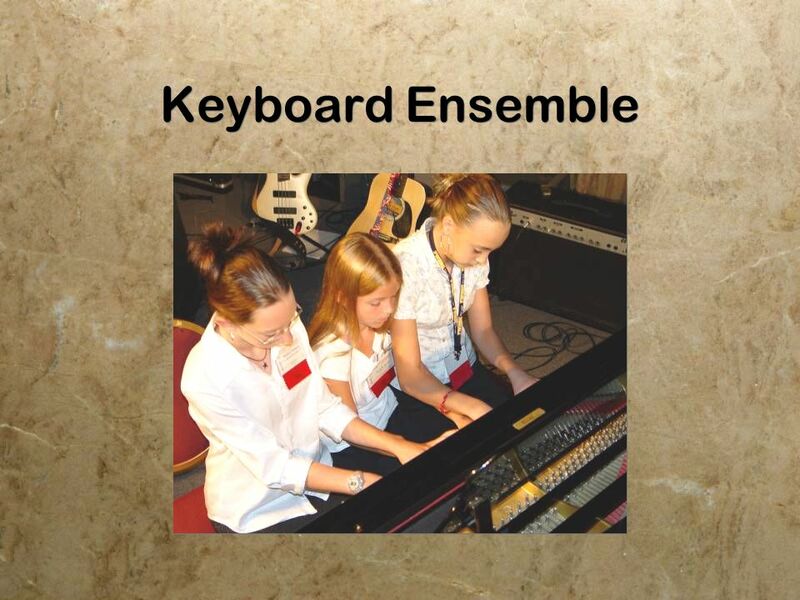 The Winkelman Family. 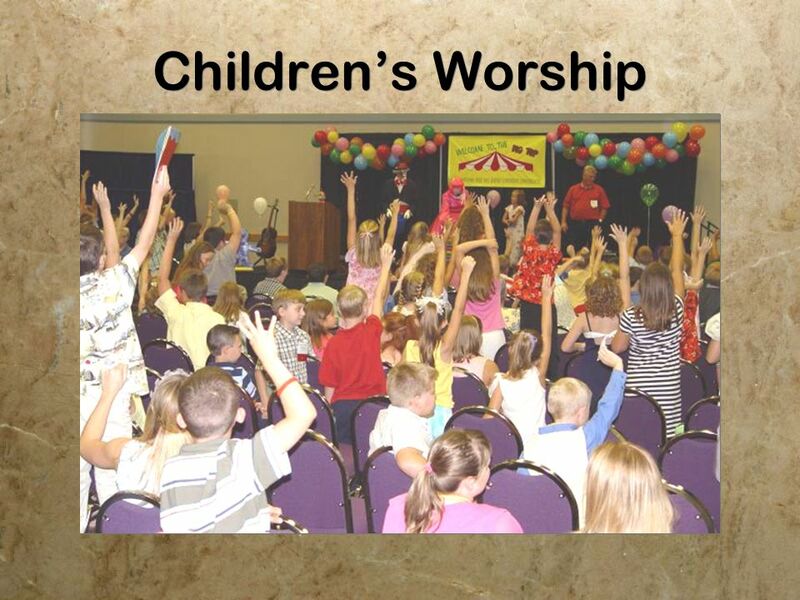 FamilyLife (A Division of Campus Crusade for Christ) FamilyLife is a division of CCC located in Little Rock, Arkansas directed by. Founders Founded in 1956 by late Bishop Tobies J. Bell The leader of the church –Bishop Floyd Marshal, and Bishop Isaiah. 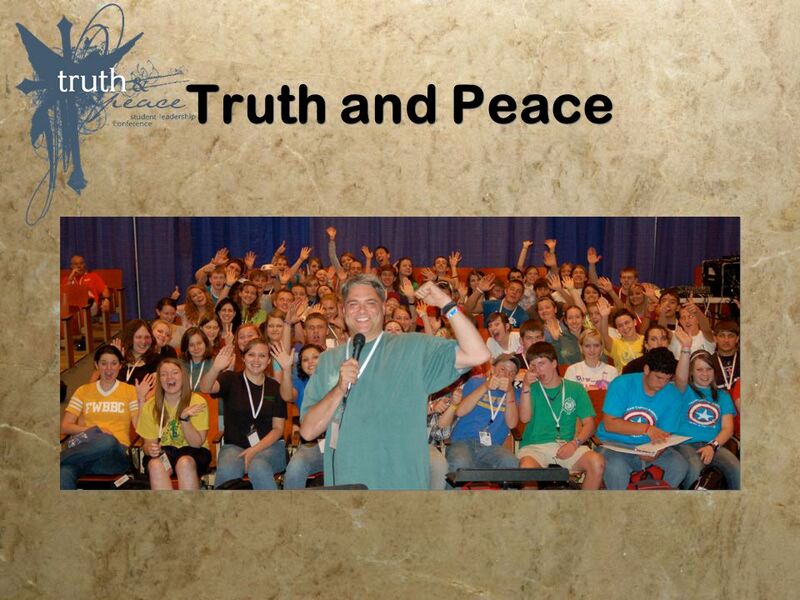 King’s Messengers Believing and Living the Gospel.